Mod movies are a rare thing so I was excited to learn about the new feature movie – Young Birds Fly – based right here in L.A. Here is the trailer for Young Birds Fly. I am bummed that we missed this when it screened in LA in May this year. 2. This film is about AMERICAN Mods. There are no Birtish working class roots here. This is all style and music-based. Come to think of it, American Mod = a much broader spectrum of 60’s culture than in England. The lines between Mod, Skinhead, Rude Boy, 60’s Hipster… are very fine. There is as much French Pop, 60’s Garage, and Latin Boogaloo in this scene as there is Rocksteady and Northern Soul. 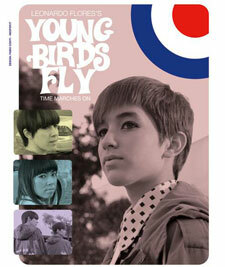 Well, here’s hoping that there will be another screening of Young Birds Fly … is the DVD out soon? This entry was posted on July 23, 2008 at 10:42 am and is filed under Film, Uncategorized. You can follow any responses to this entry through the RSS 2.0 feed. You can skip to the end and leave a response. Pinging is currently not allowed.